A binocular harness is a wearable harness built to hold your binoculars when they aren’t in use. They are far more convenient than carrying the binoculars by hand or storing them in your backpack, where you’ll then have to take them out again every time you need to use them. There are several different options that you can choose from based on your binoculars and the activity you will be doing. What is a Binocular Harness? Binocular harnesses reduce the stress and pressure on your neck that you would get when carrying the binoculars around your neck using the binocular straps. But with a binocular harness, the weight and pressure of the binoculars are distributed evenly across your entire body, reducing the burden of carrying binoculars. While the standard binocular straps are fine for short periods of time, eventually the pressure the straps exert on your neck would be far more uncomfortable than if you were using a binocular harness. This will take the weight of the binoculars off of your neck. This is why binocular harnesses are far better than straps. A binocular harness is especially useful during activities where your binoculars require better support and protection than what is provided by the standard binocular straps. Some examples would be hiking and hunting. A harness will provide far more strength than straps, making sure your binoculars are safely held in position even if you’re running, keeping swinging to a minimum. Making the binocular harness both safer, and more comfortable than binocular straps. When you need to get to your binoculars quickly, fumbling around with backpacks or binocular straps is less than ideal. This is especially annoying during hunting or birding when the timing is critical. So being unable to efficiently use your binoculars can be incredibly frustrating. Many times, once you’ve finally retrieved your binoculars from your pack, it will be too late. This is one of the biggest reasons for owning a binocular harness, to make it quick and easy to get to your binoculars when you’re out hunting or birding. So you never have to fumble with your binoculars trying to get them out of your pack. There are many different styles and types of binocular harnesses which you can purchase, which can usually be broken down into a few different categories: Full Size, Basic, Low Profile, and Dual Harness. There are also a couple of different attachment methods for binocular harnesses, which can affect both the harness’ ease of use, as well as its reliability. Binocular harnesses are split into one of four categories: Full Size, Basic, Low Profile, and Dual Harness. Below you can find a detailed description of each harness type, as well as their potential uses. A full-size binocular harness is the most widely used, and most popular binocular harness style. These usually include full sized pouches to give your binoculars as much protection as possible without being cumbersome. These are ideal for both hunting and birding, as well as general use. A basic binocular harness will employ a simple system that uses clips and ties for your binoculars. Harnesses like these are quite a bit cheaper than other styles, but they’re far less durable, and won’t protect your binoculars as well as a higher-end harness will. But it’s still far more convenient than a strap or just storing the binoculars in your pack. A low profile binocular harness will give you similar performance to the basic harness, but with upgraded, more comfortable straps, and more safety features to protect your binoculars. These are perfect for someone who wants a high-quality harness but doesn’t have the money to spare for a full size or dual harness model. A dual harness system will give you the functionality of two harnesses rolled into a single package. Allowing you to carry your binoculars, as well as a camera, or even a second pair of binoculars. Or any other equipment. A dual harness system will allow you to carry two items at once comfortably. Which is great for birding, where you may need both binoculars and a camera. There are two primary attachment methods for binocular harnesses, which can significantly affect the reliability and ease of use of the harness. Below you can find a detailed description and recommendation regarding the two attachment methods: Quick Release, and Snap-On. Of the two attachment methods for binocular harnesses, quick release is by far the most convenient of the two. It utilizes a simple buckle-like attachment that allowing for quick release and locking. However, it can be prone to small amounts of accidental releases. So while it may be more convenient than snap-on, it isn’t as reliable. The snap-on attachment method, while less convenient than the quick release method, is more reliable and secure. It utilizes a series of metal rings which are attached to the neck strap anchors of your binoculars. Although, the metal rings are known to sometimes rub against the finish on the pair of binoculars. Binoculars are very popular among hunters; they allow them to see animals and objects easily from a distance. But it can be a pain to take your binoculars out of your hunting pack every time you need to use them, and this is where the need for a good binocular harness comes in. Here are a couple of the best binocular harnesses for hunting. 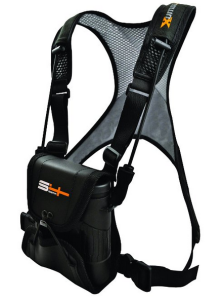 The S4Gear LockDownX binocular harness utilizes wide, padded straps and a full-size style. Providing a stable and comfortable place to keep your binoculars. The X-shaped straps spread the weight of the binoculars across your body, and the straps, as well as the back panel, are both made from breathable fabric, making the harness more comfortable, and reducing sweat. The LockDownX also includes a binocular pouch with conformable flaps to protect your binoculars and twin shock cords which you can attach to your binoculars for tension-free glassing and bounce elimination. The Badlands Mag Binocular case and harness are the optimal choices if you’re looking for a binocular case fit for professional hunting and hunting guides. The harness is durable and reliable, and weighs only one and a half pounds, with a fully enclosed case large enough to fit up to 200 cubic inches. Like many other high-quality harnesses, the Badlands Mag is a full-size harness and features breathable fabric to reduce body heat. The integrated case is built to handle all 8×32 pairs of binoculars, as well as most 10×42 pairs, and the harness includes a roll-out hydration bladder integrated into the rear center back pad. Overall, it’s an excellent binocular harness, perfect for any outdoorsman. Binoculars are one of the most important tools in a bird watcher’s arsenal, allowing them to get an up-close view of the birds without disturbing them. But birds can be quick, and often move, making it extremely inconvenient if you have to take your binoculars out of your bag every time you need to use them. Luckily, binocular harnesses remove the inconvenience. Below you can find a couple of the best binocular harnesses for birding. The Celestron 93577 binocular harness is a comfortable, high-quality lowe-profile binocular harness perfect for birding. Great for long walks where you need your hands-free, but still want your binoculars to be available at a moment’s notice, without having constant pressure on your neck. The small back plate reduces sweat and makes the harness more compact, and while not padded, the straps are thick enough to reduce pressure and distribute the weight of your binoculars significantly. The harness also utilizes a quick release system for added convenience. Overall the Celestron 93577 binocular harness is a high-quality, low-profile binocular harness, perfect for birding. The elastic model of the OP/TECH binocular harness is a perfect fit for any outdoorsman looking for a straightforward and reliable binocular harness that can self-adjust to make carrying your binoculars more comfortable and convenient. The harness utilizes a loop attachment method for added reliability. The harness is available in both a webbing and elastic model, but the flexible model is believed to be better, due to it letting you hold the binoculars closer to you when not in use, and being able to stretch to allow you to bring the binoculars up to your eye level with ease. A binocular harness is a perfect tool for any outdoorsman, whether they’re a hunter, a bird watcher, or anything in-between. They allow you to comfortably wear your binoculars without having to deal with the continued pressure a neck strap gives you and makes your binoculars far more accessible than they’d be if you only stored them in your pack.